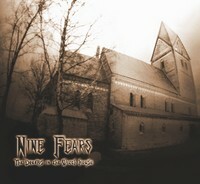 The Argentine band Nine Fears was founded back in 2002 to play heavy metal blended with gothic and black metal melodies. Lyrically they been influenced by novelists like H.P. Lovecraft, Edgar Alan Pow and J.R.R. Tolkien. As usual they had to undergo some line-up changes and released some demos. In 2006 they took part on a tribute album for Mexican band Luzbel called Tributo al Angel Caido. This is their latest demo which is based lyrically on a Lovecraft story about a history student who rents an old house which is haunted. The sextet opens up with The Age Of Men. The track starts slowly... acoustically, but then explodes with heavy riffs and pounding drums into a fast heavy tune. But the tempo changes make it differ from the usual melodic speed metal tune, even if the song is mainly based in that genre. The Argentines blend in some atmospheric parts and gothic-influenced keyboard passages as well as neo-classical guitar parts. And the song fades out acoustically, returning to the opening theme. The following However In This Land is a guitar-driven tune, not as fast as the opener, unfortunately the vocals of Roberto Castiglioni partly drown a bit in the music, but that's something which can be fixed in the studio. Here they add a dash of folk and so give the track a different feel. The guitars of Pablo Gimelli and Daniel Lescano dominate the song, but majestic vocals and mighty choirs take off the edge a bit. The beginning of The Dreams In The Witch House is classic-influenced, but then they return to fast, heavy riffs and lead you into a kind of frenzy which - I guess - should represent the nightmares of the student. Here you get elements you usually find in horror movies... and some black metal-ish parts. The last tune on this demo is a cover version of Twilight Of The Gods! They play this old Helloween tune very well and even if singer Roberto Castiglioni sounds a bit different he handles the vocals quite good. In my opinion better then Kiske's successor, but to be honest I never liked Deris sing the old stuff. At the refrain it has a symphonic touch, partly through the lead vocals and the choir, but also through the keyboard. Later the keyboard adds a symphonic-tinged melody and gives the track a different atmosphere for a bit. Well done! The 4-track demo is very interesting, but some details get lost due to the production - it's a demo, so production-wise they can improve. It would be interesting to hear the songs with a proper production. At some parts they can create an atmosphere which reminds me of King Diamond - which fits the story. But in general you can describe them as melodic speed metal with elements of neo-classical metal, symphonic parts, a dash of gothic and black metal. At their website you can listen to some samples. Check them out!